The Snail Mail – Coming This Fall, My All New Quarterly Newsletter, With Exclusive Email Only Content! Everybody likes a bit of free stuff don’t they? I produced the below audio programme and ebook to introduce people to the Slow Life. You will also be signed up to my email newsletter, the “Snail Mail” with exclusive content. If you want to learn more about the Slow Movement, then I have recorded this 48 minute audio guide, that you can get for absolutely nothing! You will also be signing up to my mailing list, so you will get exclusive updates and information (but don’t worry, I won’t bombard you with the hard sell and send you emails very occasionally, in fact, I use my list very sparingly). 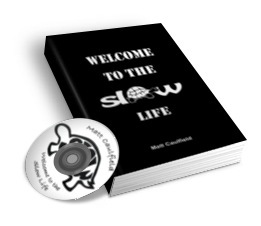 “Welcome to the Slow Life” audiobook and ebook. The current state of our harebrained society and how slowing down is the only sensible option! More detail about the “tortoise mind” and what exactly what the Slow Philosophy is. A detailed history of the Slow Movement, including some of the key landmark events. The right way to plan your time and approach time management to slow down. Chapter 5 – Who am I? A brief bio of me. Chapter 6 – What Next? How to continue your journey of slowing down. 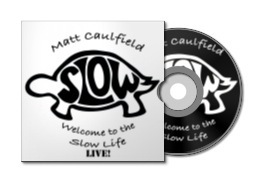 Welcome to the Slow Life LIVE! This 30 minute talk was recorded LIVE at the Vision For Living Festival in October 2009. This quarterly newsletter is packed with exclusive news, ideas, musings, and offers to keep you up to date with all the goings on in the Slow Movement. REMEMBER: I use my mailing list very sparingly just to keep you informed of new products or courses or anything else that I think you may be interested in. I will also send you an occasion newsletter or exclusive updates and offers, and you can unsubscribe any time. PS. I will NEVER sell or rent your email address and take your privacy very seriously. On occasion I may send you 3rd party products or information that I think you may find interesting, but I will never share your details with that third party.